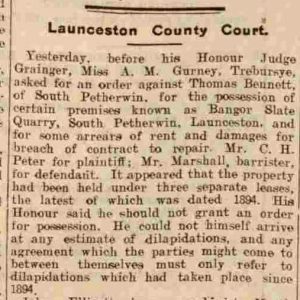 Bangors Slate Quarry | Launceston Then! the “quarry of Tremayi,’ were mentioned. In another expenses account, this time in 1465 ‘for carriage of stones from Trebursy quarry to the town; for ” scapellynge ” of stones at Trebursy, half a day, 2d.‘ It is not know if either of these quarries were indeed what is now know as Bangors, but it does show that the area around Trebursye and Tremeale provided the town with supplies of stone. The earliest mention in the modern era is with its original name ‘Alexandra Slate Quarry’ trading as the ‘South Petherwin Slate and Slab Co. Ltd.,’ when in June 1865 the lessees were seeking permission from the ‘Turnpike’ committee to raise the height of the turnpike road at the bottom of the quarry by 23 feet. A further mention of the quarry came in 1869, when the Captain of the quarry, Captain Kelly, was summoned for the non payment of wages to a dozen quarrymen. With no funds available to make a payment and with execution from the Sheriff of Cornwall on the quarry; an order of execution was made on the effects of Mr. Howarth, the lessee, if the wages were not paid. In 1868 the company was officially liquidated. The quarries continued profitability was something that would blight its history, with many a lessee hitting financial problems. The quarry at one time, had the largest water wheel in England, which was used for pumping at the quarry. However, in late 1885 the quarry again facing financial problems closed and over the following seven and half years the workings fell into disrepair through neglect and vandalism. The pit itself, no longer pumped, half filled with water. In 1894, a Mr Dierdon, came to have one more “shot to put the house in order,” for the Launceston Slate and Slab Quarry Syndicate Ltd., which had purchased the property off the mortgagees. To the clear the pit of the water was the first difficulty to be surmounted. Being a practical son of a practical father, who had for many years been connected with quarries, railroads and water works, Mr Dierdon decide that the best mode of operation would be to drive an adit from the wheel pit to the quarry. He started from the old water wheel pit (the wheel had been destroyed and so was removed) and bored successfully a distance of 300 feet, making a passage five feet six inches by four feet six inches. This took many months in doing, and it was most laborious work, requiring all the skill of an experienced man. The last blast was undertaken without the slightest accident, and the large volume of water rushed through the newly made exit. When it reached the level of the adit, pumps were resorted to and the pit thus totally cleared. But, in getting over the water difficulty it was found another yet to be surmounted was the clearance of tons of debris allowed to remain in the pit by the former workers. From one corner alone 2,000 cubic yards of rubbish had to be removed to the top. The next undertaking, therefore, was to get all the machinery once more in working order. The old steam engine, 16 horse-power nominal, was repaired. The poppet head – the only means of conveying stuff from the pit to the surface – needed considerable renovation. The old cable was allowed to remain, but a new crucible steel hauling rope of a breaking strain of fifty-eight tons was procured. A new gutter and roller path for the rope to run in from the engine to the puppet head – a considerable distance – was also found a necessity. New railroads were made, and to sum up, the quarry was wholly re-arranged. The raising of the first slab and slate was came at the end of march 1896, and a satisfactory yield was constant. Upon a slab being loosened from the bed it is immediately attached to the chain and hauled to the top of the poppet head. When immediately above the trolley, what is known as the “gate,” is lowered and the traveller thus locked while the stone or the box containing stone is lowered. This being done the traveller slides further up the cable and the gate automatically swings back to its old position. The traveller then goes down again to the pit, and the same process is gone through again. The speed at which the traveller runs down the cable can be regulated to a nicety. When a slate had been raised to the top by the means already described, it was taken over a railroad to the end of an embankment and slid down over to several sawmen, who prepared it for the planers. All this sawing was initially done by hand saws, but later two jigger saws, a circular saw were used. When the rough edges had been cut away, the slate was again taken over a railroad to the machine planning house, and levelled and smoothed to a nicety. In some cases they were prepared on both side (always so in the case of London goods) and in others on only one side. One healthy feature of the quarry was that there were an extraordinary small quantity of debris taken out. What there was was raised to the surface and then used for banking. The building stone was separated from the debris and thrown in one particular spot, where waggoners could easily load. Post & News, 9th May, 1894: Editorial: Old Wheel Removed. No longer can Launceston boast of the largest water wheel in England, as, we understand that the old wheel at South Petherwin Slate Quarry has been removed. Post & News, 11 April 1896: Advertisement: To Builders. Tenders are invited for Buildings to be erected at the Bangors Cornish Slate Quarry, near Launceston. The drawings, specifications &c., can be seen at the Quarry or at the office of the undersigned, to whom sealed and endorsed Tenders must be sent on or before the 23rd inst. Neither the lowest of any tender will necessarily be accepted. The company continued to work the quarry over the next 6 years but even with the modern machinery it struggled to compete with the Delabole and Welsh slate and with its financial viability being in question, the works were again shut down, this time for the final time. In 1909, Miss. A. Gurney, the owner, asked for an order to be taken against the last manager Mr. Thomas Bennett which was rejected by the court. 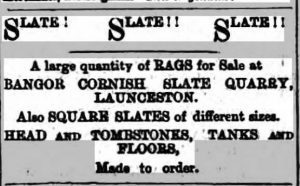 The Launceston Slate and Slab Quarry Syndicate Ltd., were officially dissolved shortly afterwards. 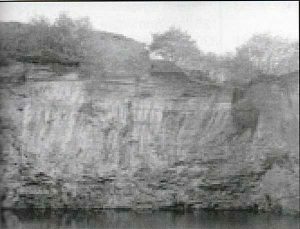 The quarry then fell into the hands of the Launceston Borough Council who then began using it as a refuse land fill site, passing onto Cornwall County Council before being closed in the early 1980’s. It was then used as a recycling centre before that too was closed in 2009. 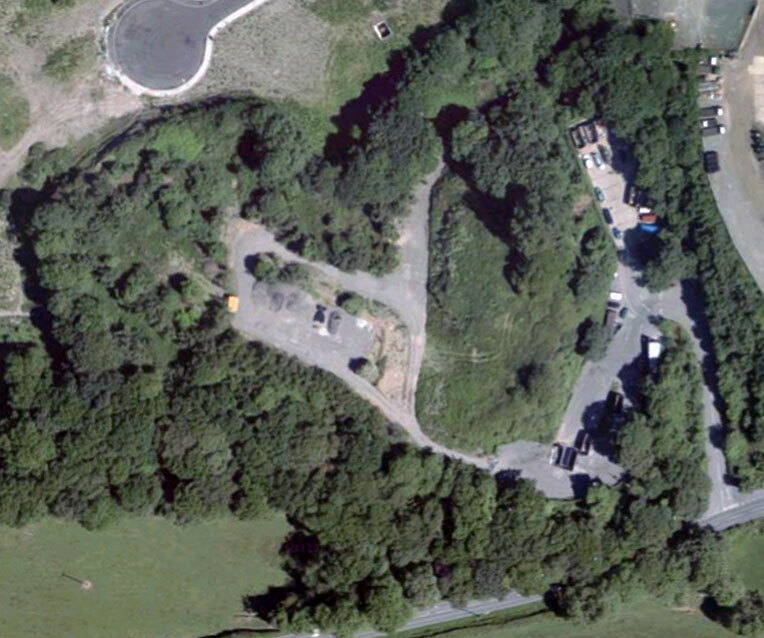 There are currently plans by Cornwall Council to used part of the site as a tarmac plant.